HOW DO I FIND THE RIGHT PICKLEBALL PADDLE FOR ME? Finding a paddle can be difficult...why? 2. You need to know which paddles are best suited for beginners, intermediate and advanced players – yes, there is a difference; not all paddles are alike. 3. Good paddles can be costly, so testing before buying saves on disappointment. First resist the temptation to purchase a used paddle from someone, unless you have already tested several paddles and know which one you want. But note that used paddles become “dead” over time, meaning the materials they are made of become compromised and don’t perform. This means you may end up with a paddle that does not have consistent performance, which is counterproductive for a player who is learning ball control. 2. has a handle that fits your hand. If you can grip it without fingers overlapping and pressing against the palm of your hand. If your fingers overlap, the handle is too small. If there is a gap between your fingers and your palm, the handle is too big. 3. has an appropriate paddle weight for you; this is important. Some paddles are weighted heavy towards the handle, others heavy toward the paddle top…the paddle should feel natural in your hand. 4. is made of good material for absorbing the force of the ball. The middle of the paddle is referred to as the guts of the paddle -- what it is made of. Most paddles are made with a honeycomb material for its main component An aluminum honeycomb core will absorb the force of the ball and allow for better control between “soft” and “hard” shots. But note that aluminum honeycomb cores will add weight to a paddle. There are other honeycomb cores which will also allow for ball control. And then there are some manufactures who use compressed style components. 5. has a slick outside surface of the paddle. The surfaces available range from plastic to graphite. A surface that is slick is usually designed to create pace on the ball -- great for players who have managed to control their shots between “soft” & “hard”. Surfaces will a slight grip surface (multiple bumps) is designed to grab the ball and slow down the speed. The bottom line? It all depends on what type of player you are -- beginner, intermediate or advanced -- as to what style of paddle you are looking for. The BEST place to purchase a paddle is when we host a “Paddle Demo Day”, where multiple paddle manufactures allow you to try paddles on the court to see how they feel and react to the ball. Next best place to shop for a paddle is a local tournament. 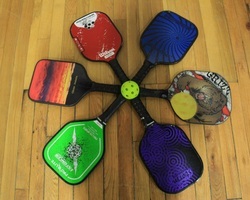 Several paddle manufacturers are available and usually will let you try a paddle on a practice court or towards the end of the event when courts become available. This is a lot of information to absorb, but well worth spending the time to research before putting out $50 to $100 for a paddle that may end up being the wrong one for you.